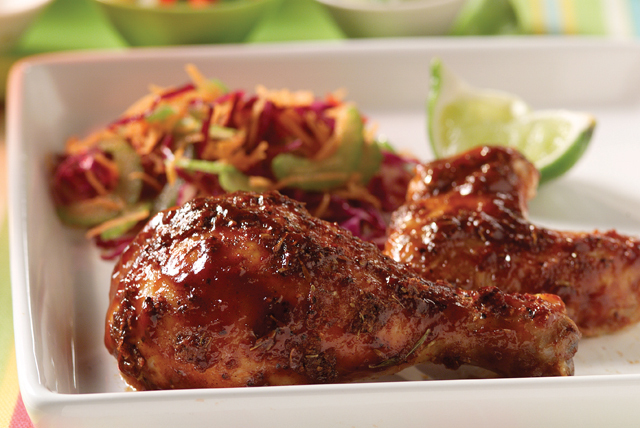 Lime juice and cinnamon added to a sweet BBQ sauce make our Caribbean BBQ Chicken an island favorite. Heat grill to medium heat. Trim and discard excess fat from chicken. Mix seasonings in small bowl until well blended; stir in lime juice to form paste. Rub onto chicken. Place chicken, skin-side up, on grill; cover with lid. Grill 25 min., turning and brushing with 1/4 cup barbecue sauce after 15 min. Turn chicken over; brush with remaining barbecue sauce. Grill 5 min. or until chicken is done (165°F). For more flavor, rub the paste under the skin of the chicken before grilling. Rub chicken with paste as directed; refrigerate up to 24 hours before grilling as directed.